Continuing the legacy of Noctua’s classic NH-U-series, which has received more than a thousand awards and recommendations from international hardware websites and magazines, the NH-U12S has become a benchmark for slim, highly compatible 120mm single tower coolers. The TR4-SP3 version is a tailored custom model for AMD’s TR4/SP3 platform (Ryzen Threadripper / Epyc) and features a larger contact surface as well as the latest SecuFirm2™ mounting system for socket TR4/SP3. Topped off with the renowned quiet NF-F12 PWM 120mm fan, Noctua’s proven NT-H1 thermal compound and a full 6-year manufacturer’s warranty, the NH-U12S TR4-SP3 forms a complete premium-quality solution that combines outstanding performance, superb acoustics and excellent compatibility for high-end TR4/SP3 systems. Please note that the NH-U12S TR4-SP3 is a dedicated version for the AMD TR4/SP3 socket. Due to its customised larger base, it cannot be used on any other sockets and is incompatible with Noctua’s standard mounting kits. Tens of thousands of enthusiast users all over the world swear by the NH-U12S’ quality and performance. Recommended by more than 200 international hardware websites and magazines, it is renowned as being one of the best 120mm coolers on the market. At 70x56mm, the copper contact surface of the TR4-SP3 version is more than double the size of the standard model. Tailored to fit the enormous integrated heat-spreaders (IHS) of AMD’s TR4/SP3-based processors, this customised design allows for an optimal heat flow from the CPU over the base to the heatpipes and on to the cooling fins. With five heatpipes and the powerful NF-F12 120mm fan, the NH-U12S achieves outstanding cooling performance while maintaining excellent compatibility: At 158mm height and 125mm width, it is short enough to fit most modern tower cases and stays clear of the top PCIe slot on most motherboards. Recommended by more than 150 hardware publications and thousands of enthusiasts world-wide, the Noctua's premium quality NF-F12 Focused Flow™ 120mm fan is renowned to combine superb static pressure, excellent heatsink performance and surprising quietness of operation. The NF-F12 120mm fan supplied with the NH-U12S supports PWM for convenient automatic speed control through the motherboard. In addition, the maximum fan speed can be reduced from 1500 to 1200rpm using the supplied Low-Noise Adaptor for even quieter operation. Noctua’s SecuFirm2™ mounting systems have become synonymous with quality, safety and ease of use. The TR4-SP3 variant has been completely custom-designed for the new socket and is particularly easy to install: Put on the heatsink, fix the four spring-loaded screws and you’re done! In order to assure optimal compatibility with SLI and CrossFire multi-GPU setups, the SecuFirm2™ mounting for TR4/SP3 makes it possible to offset the cooler by 3 or 6mm towards the upper edge of the motherboard, thereby increasing clearance of the top PCIe slot. Noctua products are renowned for their impeccable quality and outstanding longevity. Like all Noctua fans, the supplied NF-F12 features an MTTF rating of more than 150.000 hours and the entire NH-U12S package comes with a full 6-year manufacturer's warranty. Noctua has long been widely heralded for its NH-U12S CPU cooler, and we now have the opportunity to deploy the solution to AMD Threadripper and benefit from great thermal performance. A simple, elegant installation platform and professional-grade cooling ability lands the Noctua NH-U12S TR4-SP3 placement on any performance-oriented Threadripper PC build. Inutile de régler votre poste, ceci n'est pas une hallucination. La grosse surprise nous vient d'un système de refroidissement par air de chez Noctua, qui se positionne comme l'un des plus endurant sur notre Threadripper 1920X. Le NH-U14S TR4-SP3 survole le débat en aircooling et enterre quasiment tout le panel de kits AIO. [...] Le candidat à disposer du meilleur ratio performances/bruit est le NH-U14S TR4-SP3 de Noctua, encore lui. Il se fera largement entendre lorsqu'il sera sollicité au maximum de ses capacités, mais reste toutefois dans une tranche raisonnable. The results from this benchmark were rather shocking as the Thermaltake Floe Triple Riing RGB 360 TT Premium Edition ($199.99 shipped) AIO CPU liquid cooler didn’t blow the Noctua coolers out of the water. The Thermaltake Floe Triple Riing RGB 360 had the lowest idle temperature by 1C, but the load temps were nearly 2C higher than the Noctua NH-U14S. These Noctua air coolers do a pretty good job! Bei dem Temperaturen zeigt sich die All-in-One-Wasserkühlung nur für wenige Minuten überlegen, denn das Wasser zu erhitzen braucht seine Zeit. Nach 30 Minuten Last mit Prime95 steht ein Patt mit dem NH-U14S zu Papier. So lange die AiO braucht um auf Touren zu kommen, so lange braucht sie im Anschluss auch wieder um ruhiger zu werden: Ein Luftkühler hat nach wenigen Sekunden im Leerlauf die Drehzahl bereits wieder abgesenkt, weil die CPU nur noch minimale Abwärme erzeugt, bei der AiO dauert das länger. Jak vidíte, uchladit moderní multijádrové procesory dá docela práci a klasické vzduchové chladiče zde už ukazují své limity. A to RYZEN 2950X není zdaleka nejvýhřevnější procesor na trhu, to Core i9 dokáže topit ještě mnohem více. Takže ano, všechny chladiče včetně malé 92mm NOCTUA U9 jsou běžně použitelné i pro tenhle čip a uchladí ho tiše i v maximální zátěži! Chłodzenie zapewnia dobre temperatury podczas pracy Threadrippera a także prezentuje dobrą kulturę pracy. Umożliwia ono też OC procesora. Warto też zwrócić uwagę na świetną jakość wykonania. Według mnie spokojnie możecie je kupować – nie będziecie tego żałowali. The NH-U12S TR4-SP3 cooler is an alternative to the NH-U9 TR4-SP3. If we have more space in the PC case then it can be a bit better option. It’s quiet, performs well and is the top quality product so we don’t have to worry about any compatibility issues or anything else. You probably will already have noticed it, but the U12S and U14S managed to cool better than the Kraken X40 LCS cooler, especially the U14S crunches down the cooling numbers. That's impressive, but also wasn't a very likely thing to happen. Here's my thought on that, it's the full cover heat block on the Noctua coolers that draw every Watt of heat they can deal with until they run out of capacity. Even tweaked with 16 cores at 100% stress / 1.38V the U14S managed to stay four degrees cooler compared to that Kraken X40 LCS unit, which is a lot in the cooling arena. Now of course, once you go pro with liquid cooling and bigger radiators, the dynamics will shift. But none-the-less this was very impressive to see. Wie man anhand der Messungen klar erkennen kann ist Fläche Trumpf und dementsprechend reihen sich die Kühler auch ein. Während bei unserer getesteten Mindestdrehzahl von 600 Umdrehungen alle Kühler in das Limit laufen, sehen die Werte ab 900 Umdrehungen zumindest schon einmal für den Noctua NH-U14S sehr gut aus. Ab 1200 Umdrehungen kommt auch der NH-U12S in Fahrt und kühlt den Prozessor adäquat ohne in das Limit zu laufen. Der Noctua NH-U9 konnte bei unserem Testsetup erst auf maximaler Drehzahl den Threadripper auf Temperatur halten. After some time of prolonged full load, the CPU clock starts to drop off to very low values intermittently, is the cooler insufficient? 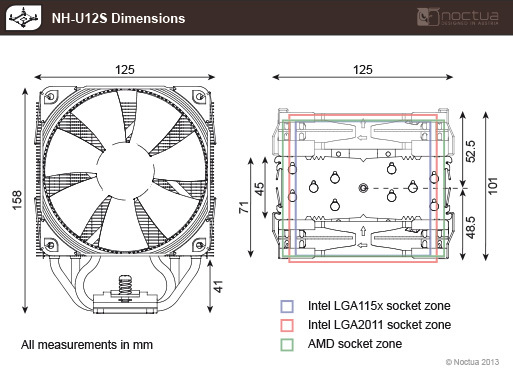 How big is the NH-U12S and how much clearance does it provide for RAM and chipset coolers? Which Noctua coolers are compatible with Ryzen Threadripper 2? Even with a high-end cooler, the performance is not what I would expect, what can I do? This behavior is usually due to overheating of the voltage regulation module (VRM), which provides the CPU with power. To stay within a defined temperature threshold (defined by the component and motherboard vendor) and to cool down the VRM, the clock speed of the CPU might be reduced to very low values. When the temperature of the VRM is back within a safe range, the CPU clocks will be increased back to the expected values until the temperature limit is reached again. Internal tests at Noctua have shown that not all motherboards on the market are able to power the 250W models at prolonged full CPU load without the VRM running into thermal throttling. In case you experience the behavior described above please, check the VRM temperature (e.g. via HWinfo) and provide additional cooling to this area. In doubt, please contact your motherboard manufacturer for further information. As it is not possible to reliably calculate or control the forces that act upon a system during transport (e.g. in shipping), we generally recommend, for safety reasons, taking the fan off the heatsink in order to reduce the weight below 700g. Noctua cannot be held responsible for any damage that may arise due to excessive stress during transport if you keep the fan installed. Please see our TDP guidelines for details. First of all, please note that results in reviews might show different results as many tests are conducted in open test bench configurations outside a chassis, which allows a better supply of fresh air and thus allows the coolers reach lower temperatures than in a real-world setup inside a chassis. Secondly, processors emitting heat-loads of 180-250W or even more (with Turbo Boost) create more challenges for case ventilation than lower power mainstream CPUs as it is very difficult to remove so much heat from the chassis. For best performance, it is crucial that sufficient amounts of fresh air can enter the chassis and that warm air leaves the chassis as fast as possible. Internal testing at Noctua has shown that many PC cases are rather restrictive when it comes to air intake and exhaust due to dampening materials, doors, covers or a rather closed design approach in general. Increasing the number of system fans can help to a certain degree but will not provide much improvement if intakes and outlets are too resistive. The best cooling results are to be expected from cases which use a rather open approach (e.g. mesh walls and intakes). Unfortunately, Noctua cannot provide detailed recommendations for individual system configurations as there are too many options and variables available to give general recommendations. Please refer to general case cooling guidelines such as this one for information how to setup the airflow inside your case.